My writer-friend Karen Tyrrell has launched her latest book, and the operative word is LAUNCH. 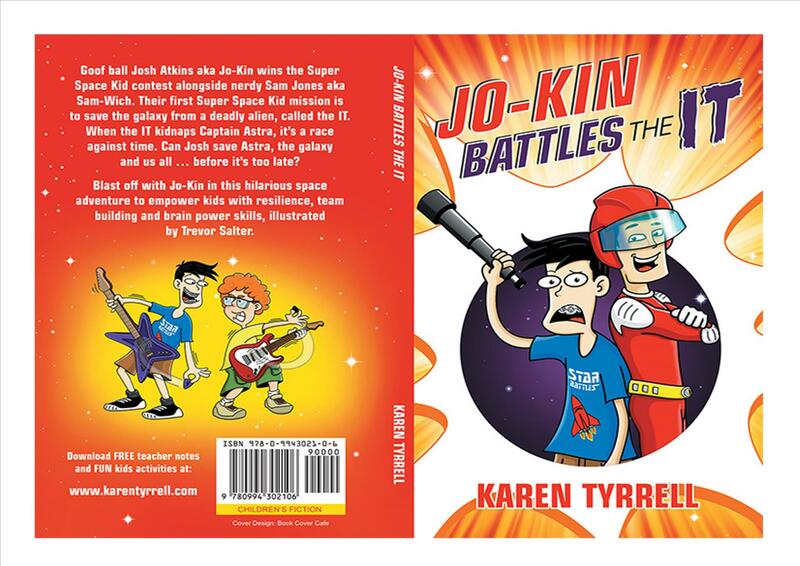 Jo-Kin Battles the It is the first book in a zany Super Space Kids sci-fi series for young readers. Jo-Kin (aka Josh Atkins) is a funny but flawed, easy to like hero-in-the-making. As a lonely star-gazing super-geek, he’s the boy least likely to save the universe. All he needs is a teammate and an opportunity. Full of action, adventure, and slobbering space monsters, Jo-Kin Battles the It is an intergalactic odyssey to be loved by any little earthling. Josh has enjoyed a stellar solo career as a gamer, but now, with the earth’s survival at stake and his friends in danger, he has to put his gaming prowess to the test and learn to be a team player. Author Karen Tyrrell does a great job of weaving the cooperation lesson in without being preachy or heavy-handed. Action-packed and full of adventure, this book is sure to entice reluctant readers–particularly boys who’d rather be gaming. There’s plenty for girl readers to like in this book too. The illustrations have a zany comic book vibe that is sure to appeal to kids. I had the privilege of interviewing Karen about her interest in the Sci-Fi genre, and I also asked how a teacher could use the book with primary students. Let’s talk about genre. Jo-Kin Battles the It and the Super Space Kids Series are clearly sci-fi. Where did your interest in the genre come from? I’ve loved sci-fi since I was young watching kid’s sci-fi TV series Superman and Lost in Space. In high school, I read Day of the Triffids, and all the Jules Verne novels: Time Machine, Journey to the Centre of the Earth and 20,000 Leagues under the Sea then later the DUNE series. I watch every sci-fi movie when it’s released. I can’t wait to see The Martian and Tomorrow Land. How does a sci-fi writer do research? You can’t exactly jump in a space ship or try on hover boots. Can you share some of your favourite sources? I watch how-to videos on You-tube to learn how something works, e.g., hover boots, rocket launches, quad bikes, jet packs and more. For the gaming sections in JO-KIN, I played Wii and computer games with my son who taught me the correct “lingo” and all the right moves. Describe your readers. Who will love Jo-kin Battles the It? Kids 7-12 who love hilarious action-packed adventure stories. Kids will love watching the underdog succeed after a series of trial. Kids who love barracking for the hero to rise and help save the galaxy. BIG kids who are sci-fi buffs will get a giggle. 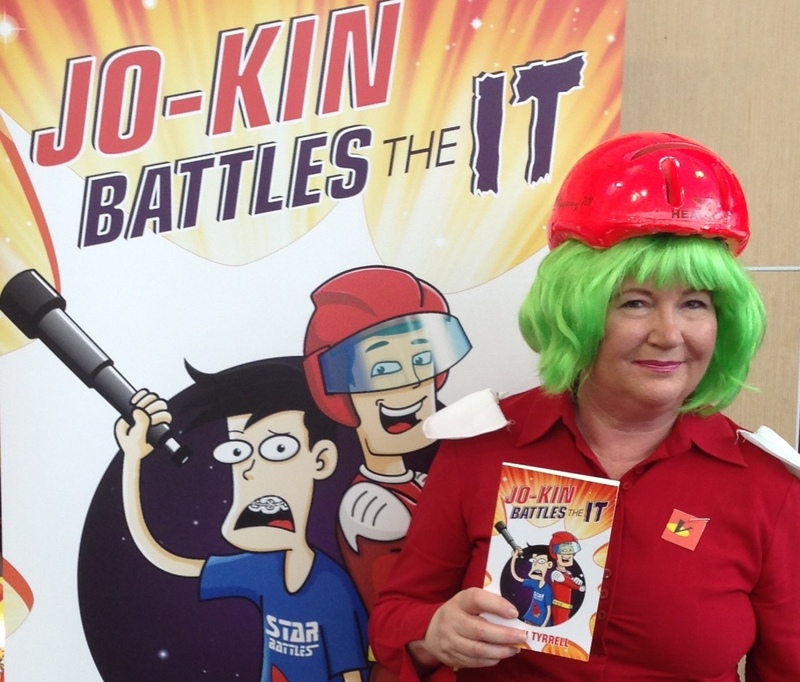 Let’s say a primary school teacher wanted her year 6 students to read Jo-kin Battles the It. How could a teacher exploit the book to best advantage? Does it lend itself to science lessons? The teacher should write a science and literature based unit around Jo-Kin Battles the It. She should read a chapter or two per day in the classes’ read-aloud time with lots of discussion on imagination, teamwork, resilience and brainpower leading to creative writing. With science, the teacher could feature topics: the solar system, the night sky, gravity, and space travel. 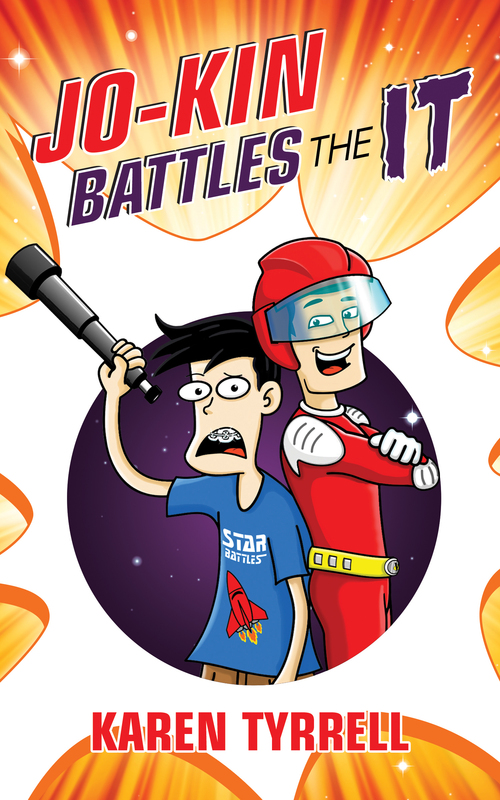 JO-KIN Battles the It SUPER Space Kids #1 is a STEM novel featuring science, astronomy, Mars, techno gadgets, and explains super-hero powers. Download FREE teacher resources and kids activities: science and astronomy sheets, creative writing, humour & family themes, team power, quiz and colour sheets. Would students enjoy writing a sci-fi story? Students could write their own sci-fi story after a brainstorm of possible scenes and characters. Or they could write to a certain topic, e.g., How to Build a space ship, Be a super hero and Life on Planet X. The class could discuss how to structure a sci-fi story or where to start. I always start my sci-fi stories by thinking of a twist ending and writing the story backwards. I’ve read the book and loved the action and adventure, as I mentioned in my review above, which is from Amazon. (<Click that link to buy a copy. If you love it, be sure to leave a review of your own–that’s the best way to support an author!) Thanks to Karen for inviting me to be a part of her blog tour. I loved watching this book come together, so it’s a thrill to see it blast off into the world! Far Out! Karen can rock green hair! Win one of four eBooks of Jo-Kin Battles the It OR signed artwork from the illustrator. Thanks for your awesome support of Jo-Kin battles the It with your review and in depth interview on how to write Sci-Fi for KIDS and schools. I found this interview most informative especially the question and answer about doing research. Well Done on another successful interview.